Established in 1964 with the goal of ``liberating Palestine in its entirety,`` the Palestinian Liberation Organization has for years been led by one of its most outspoken and notorious members, Yasser Arafat. Born and raised in Cairo, Arafat has undergone a radical transformation from a fugitive terrorist leader to a passionate and respected advocate for the creation of a Palestinian homeland. But then why did he reject a plan for Palestinian statehood in 2000, after crusading for this long-standing ideal for close to forty years? Was it a bargaining ploy or a reflection of a deeper reluctance on the part of the Palestinian leadership to genuinely commit itself to peace with Israel? 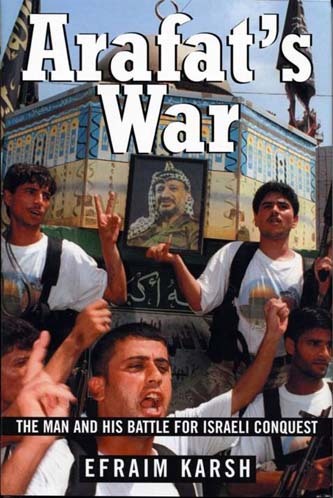 Offering the first comprehensive account of the collapse of the most promising peace process between Israel and the Palestinians, historian Efraim Karsh argues that Arafat is less interested in the liberation of the West Bank and Gaza, or even with the establishment of a Palestinian state, than in the PLO`s historic goal of Israel`s destruction. Karsh details Arafat`s efforts since the historic Oslo peace accords in building an extensive terrorist infrastructure, his failure to disarm the extremist groups Hamas and Islamic Jihad, and the Palestinian Authority`s systematic efforts to indoctrinate hate and contempt for the Israeli people through rumor and religious zealotry. The result is a level of violence unmatched in scope and intensity since 1948, a Palestinian campaign of terror that has included suicide bombings, drive-by shootings, stabbings, lynchings, and stonings and has resulted in thousands of casualties. Arafat has irrevocably altered the Middle East`s political landscape, and while his place in history has yet to be written, the ongoing Israeli-Palestinian conflict will always be Arafat`s war. Afraim Karsh is professor and head of Mediterraneen Studies at King`s College, University of London, and is a frequent contributor to The New York Times, the Los Angeles Times, the Daily Telegraph, and the London Times. He is the author of several books, including Sadam Hussein: A Political Biography and Empires of the Sand: The Struggle for Mastery in the Middle East 1789-1923. He has appeared on Nightline, Larry King Live, and NPR`s All Things Considered.